A look at where defense ties are and where they might be headed. As I have emphasized before, though the Philippines, a U.S. treaty ally, has traditionally not had much in the way of a defense relationship with China, Beijing’s deepening security ties with the Manila have become a familiar story in the Duterte era. Even though progress has been much slower than the rhetoric might suggest, we have also admittedly seen forms of cooperation that were previously unthinkable, from deliveries of military equipment to closer coast guard cooperation and even law enforcement assistance (See: “What’s in the New China Military Assistance to the Philippines?”). On October 25, as part of a series of defense interactions held alongside the ASEAN Defense Ministers’ Meeting (ADMM) and the ASEAN Defense Ministers’ Meeting Plus, Philippine Defense Secretary Delfin Lorenzana met with his Chinese counterpart, Chang Wanquan, at Camp Aguinaldo. According to the Philippine Department of National Defense (DND), their conversation focused on ways to strengthen their defense ties in the coming months. One issue area of focus was boosting cooperation in the fight against terrorism and violent extremism. China has already provided assistance to the Philippines following the siege in the southern city of Marawi by Islamic State-linked militants, though, as I have pointed out before, the amount has been quite small thus far. That said, Chinese officials have said that a new round of assistance can be expected soon. The two sides talked about how their cooperation might be enhanced in areas such as intelligence-sharing, counterterrorism exercises, and other forms of training. While such collaboration still remains quite rudimentary in the realm of counterterrorism strictly speaking, Beijing has been trying to make incremental inroads such as through law enforcement training. Another issue area was maritime cooperation. Unsurprisingly, the key focus was on humanitarian assistance and disaster response (HADR) and anti-piracy operations in the southern Philippines. As I have noted before, China has expressed interest in some sort of involvement in addressing transnational challenges in the Sulu-Sulawesi Sea amid its emergence as a platform for subregional cooperation, be it in the form of exercises or patrols or in the form of military equipment with high-speed boats being delivered to the Philippines (See: “A US-China Role in the New Sulu-Sea Trilateral Patrols?”). Official Chinese accounts of the meeting in particular also played up the discussion both sides had on ‘decreased tensions’ in the South China Sea. But there has been no significant progress made thus far on specific proposals, including that of a bilateral negotiation mechanism to work out differences that was only vaguely referred to (See: “The Danger of China-Philippines South China Sea Joint Development”). Meanwhile, as I have noted repeatedly, despite efforts by both Manila and Beijing to downplay their disagreements and pursue warmer ties in other areas of the relationship, including the so-called draft framework on a code of conduct (COC), the basic equation in the South China Sea still remains the same and China continues to inch toward effective control of the area at the expense of rival claimants (See: “Will a China-ASEAN South China Sea Code of Conduct Really Matter?”). What’s in the New China Military Aid to the Philippines? Both sides have hailed the move as a step forward for their defense ties. 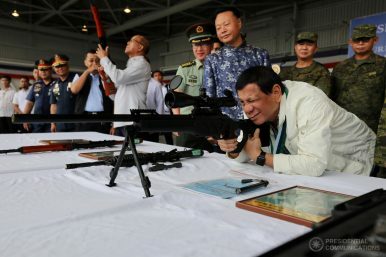 The Truth About China’s New Military Aid to the Philippines What’s in the New China-Philippines Defense Industry Pact?Will Duterte’s Philippines Now Buy Arms From China?China Gives New Equipment to Philippines for Marawi RecoveryWhy Did China’s Warships Visit the Philippines?